DEAR JERRY: Because "Breaking Bad" doesn't identify the music they use, someone once asked you to name the amusing Italian song heard in the Season 3 finale. Now they've done it again, this time in what will be the last episode until mid-2013. As with the Italian tune, it's another unknown song with extremely fast singing. This one is in English, and is playing while Walt and Todd are busy working in the lab. Because their activities are shown at double or triple speed, the rapid lyrics kind of fit what's going on. Even IMDb lists only original music written specifically for the show, but nothing else. Hope you can go two for two on "Breaking Bad." DEAR ANDREA: You bring up the only criticism I've ever heard about "Breaking Bad," AMC's critically acclaimed and highly rated series. Meanwhile, until the producers and/or IMDb acknowledge the non-original music used, I will gladly handle the investigations (and maintain a high batting average). Unlike the Italian tune we discussed last year, Quartetto Cetra's "Crapa Pelada (Testa Pelata)," one previously unknown outside Italy, the song you are asking about is quite familiar to oldies fans in America. Titled "Goin' Down," it is by the Monkees, and is found on the flip side of their million-selling "Daydream Believer" (Colgems 66-1012). 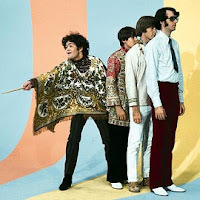 All four Monkees, Michael Nesmith, Davy Jones, Mickey Dolenz, and Peter Tork, wrote and sing on "Goin' Down," though the lead vocalist is Dolenz. As you say, Mickey's speedy singing is an ideal piece to accompany the fast-moving time-lapse sequence in "Breaking Bad." DEAR JERRY: Most albums come wrapped in plastic, which must be removed to get to the disc. Quite often there are stickers on the wrap, which usually get tossed in the trash along with the plastic. Now I'm having second thoughts. Should I start saving those stickers? DEAR ERIK: Unless the stickers are obviously ones applied by the retailer, such as for pricing or inventory purposes, cutting them away from the shrink wrap and sliding them inside the LP cover would be a good idea. Stickers, or anything else in the way of extras from the record pressing plant, pertaining specifically to that album, will always be worth saving. And there's no risk in doing so. Other commonly used inserts include: photos; booklets; artist bios; lyrics sheets; custom inner-sleeves; bumper stickers; decals; postcards; games; and publicity flyers. Many examples exist where having the extras significantly increases the value of the album, especially with the more collectible artists (Elvis, Beatles, etc.). IZ ZAT SO? It is possible "What's Your Name" sat around unnoticed for so long because radio programmers didn't recognize the names Don (Trone) and Juan (Johnson). They likely didn't know that "Juan" Johnson previously sang with the Genies, the doo-wop quartet who charted in 1959 with "Who's That Knocking" (Shad 5002). 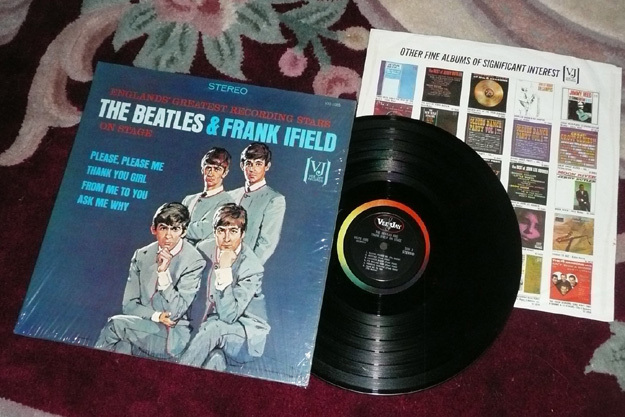 This Beatles & Frank Ifield ‘On Stage’ album sold for a heavyweight price when the vinyl recently appeared for sale on eBay. The 10 day auction quickly started a bidding war, securing bids that took its .99 cent start price to $2500.00 in less than 90 minutes. It was all uphill from there, with the seller finally landing $22,268.68 for a record that was originally issued in 1964. 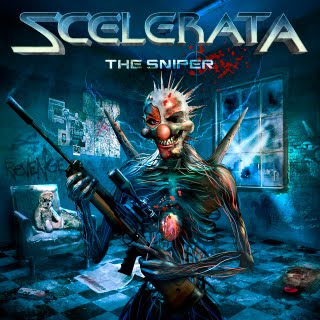 The new effort called 'The Sniper is scheduled for release on November 6, 2012 via Nightmare Records. 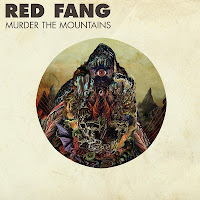 According to a press release the album "will undoubtedly turn heads, forcing metal icons to watch their rearview mirrors as these guys pull up fast with the nitrous afterburners firing!" 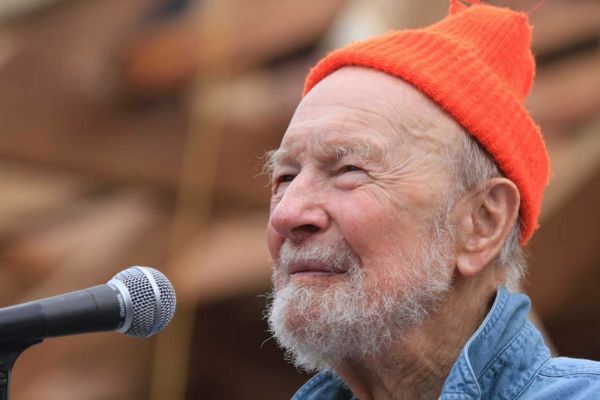 any 93 year old man who can enlist the help of Bruce Springsteen, Steve Earle, Emmylou Harris and more gets our thumbs up! these classic rockers have their marketing hands on just about everything! we are all adults here, so for those who don't like the 'f' word, don't watch. thsi is what punk rock is all about! from the iHeartRadio Music Festival a few days ago. Slash - Bad Rain - Live!! The song comes off the former GUNS N' ROSES axeman's second solo album, "Apocalyptic Love", which sold around 38,000 copies in the United States in its first week of release to land at position No. 4 on The Billboard 200 chart. 6. Luella & The Sun - Luella & The Sun 10"